Santa Cruz, California is dear to my heart, having lived there in the early 1990's. Some of my dearest friends continue to call it home and, from time to time, I am fortunate enough to visit this enchanted place. The dearest of those friends, Miss Mary, and her three fabulous sisters and I converged on the family Beach House in beautiful Aptos, California, which is where Facilities Manager and I married several years ago. Special? Yes, that kind of special. Anne, one of the sisters, has taken it upon herself to garden the rock retaining wall just outside of the sliding glass doors with the sea just on the other side. 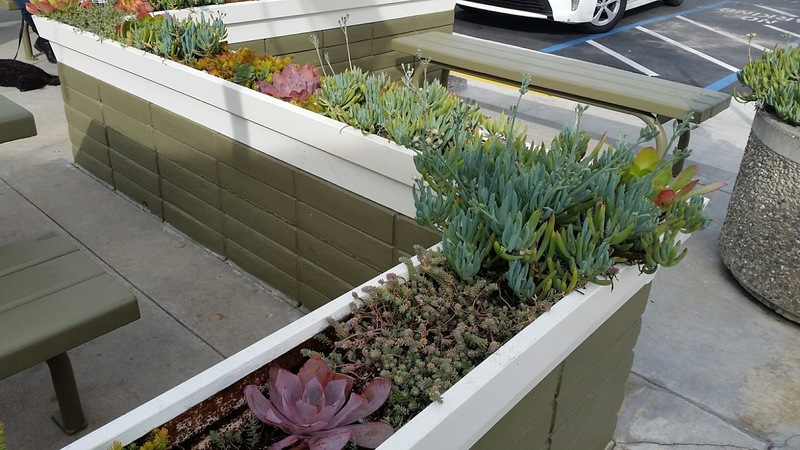 With lots of hard work, this small succulent garden grabs the attention of all who come across it. Anne claims she is no gardener and knows not the names of her well-chosen succulents; no matter, she intuitively knows what to do. They bring beauty and life to the rock wall separating the beach house from the sands of Monterey Bay. Here is a recap of this small but enchanting garden on the edge of the sea. Tucked in among rocks and shells is Anne's succulent garden. A terrible storm ravaged it last winter, but it certainly doesn't show. Anne works at the Lazy K at Orchard Nursery & Florist in Lafayette, so is around plants all the time. I asked her source for succulents for this garden, she sited Succulent Gardens in Castroville, a little farther south along the Monterey Bay coastline. I will make a trek there someday, I did not make it this trip. Blue skies, Agave attenuata and the ocean. Why don't we live here? Agave, aeoniums and sweet alyssum sprinkled in for good measure. Another smaller Agave attenuata tucked in. Crassula ovata or jade plant in the center, Echeveria 'Perle Von Nurnberg' lower left. I have grown and killed both of these plants in my day. Senecio vitalis in the center, otherwise known as blue chalk fingers. Aeonium arboreum 'Zwartkop' adds a splash of bold contrast to a green garden. 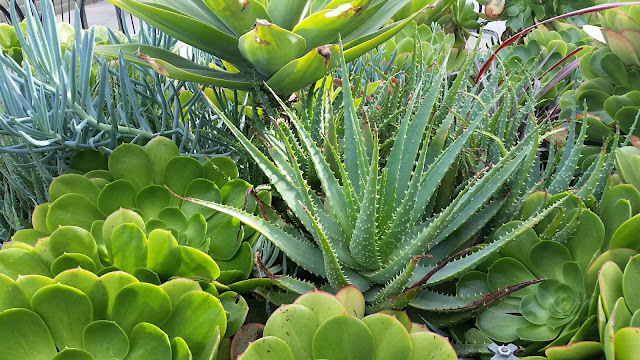 Aloe nobilis in the center. Beautiful Gazania linearis (I believe) or treasure flower from South Africa. 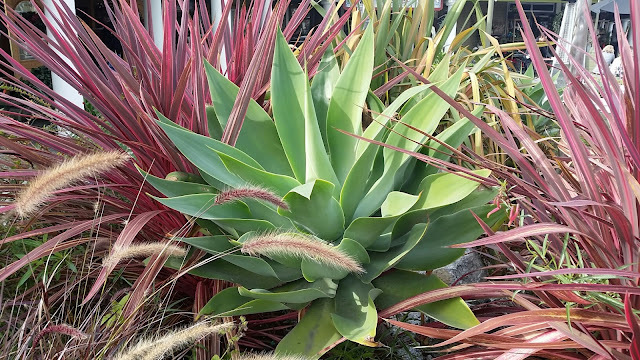 According to the Kew Science website, it is listed as invasive in Southern California, I do not see that it has been listed as such in the north. For us in Oregon, it is mostly an annual. Portulacaria afra in the center. With a few treasures found that weekend . . . many sand dollars. Agave attenuata which apparently was whipped about in the last major storm, but came back strong with new growth and now facing a new direction. Our morning view along Monterey Bay. Anne also planted up a few containers tucked in underneath the beach house windows. Portulacaria afra 'Tricolor' spilling out. A variety of echeveria and other succulents. How about that baby growing at the tip of the leaf? What a way to reproduce! I have to bring the beauty to Oregon! I hope these starts will grow to a nice large size and make Anne proud. So, admittedly, I did not go far from the beach house this weekend. 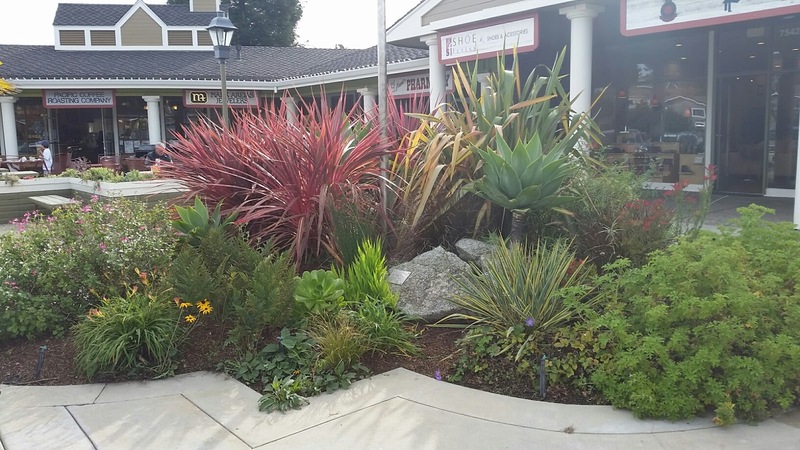 I did manage to hit one small shopping mall in Aptos, i.e., the Rancho del Mar Shopping Center. The visit is of note to me for the drought-tolerant landscaping. Aeonium, Sedum 'Angelina', Senecio vitalis and Agave attenuata feel very lush, but are all quite drought tolerant. Most landscapes I observed tended towards drought-tolerance, a wise choice for a California garden, even the wetter coastal areas. Agave attenuata again, surrounded by cordyline, phormium and some form of red Pennisetum or fountain grass. This looks like a Cuphea, as i.d. 'd by Kris Peterson, thank you! Although not an ideal photo (I was trying to give customers at tables eating lunch a little privacy), the idea is illustrated. A rather creative way to provide privacy and shelter while decreasing the concrete footprint. 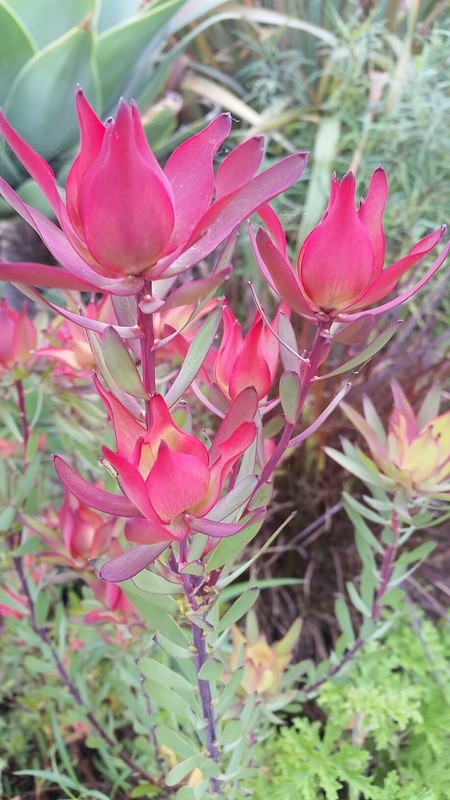 Leucadendron, possibly L. salignum 'Blush' - thank you for the i.d. Kris Peterson! Oh, to live with such succulents year-round. I do envy my California friends. What a weekend! Friends, the sea, succulents and sunshine. One last thing - my dearest friend Mary saved a special book for me. Her aunt Gin who passed away peacefully at age 97, left this family book once owned by her brother in-law, a botanist, to me. Although in an old German typeface, it is nonetheless beautiful and the illustrations are in a sans serif font that can easily be read. This 1912 book will be a treasure to me for the rest of my life. Thank you, Aunt Gin, Mary, and the whole family. This, to me, is what is important - sharing our common history with love, gratitude and reverence for our world around us, for these are the best of our human traits. Let us celebrate such things: friends, plants and all living things, laughter, the passing down of treasures, the acknowledgement of that which has come before us. Wow, wow, wow. So much fun to see all this. That wouldn't be a terrible place to live, would it? Oh, it is a wonderful place to live. I wish! Oh, it is...so lovely, such great weather. Sigh indeed! Oh to live on the stretch of coast between Monterey and Morro Bay. I think you can grow anything there ! I hope your friend doesn't commute to Orchard Nursery every day from Aptos??? I think you can grow anything there! Oh, my friend lives in Walnut Creek, this is the family getaway beach house. Could you imagine that commute? I'm sure someone does it! Hi Max, thank you for reading and for your comments. I have NOT made it to the Ruth Bancroft Garden, shame on me! Next time I will carve out a whole day just for that. I hope you get to the coast soon, it's very invigorating. As I viewed those first photos, all I could think of was: I need more rocks for my succulent beds! Anne did a beautiful job with hers. 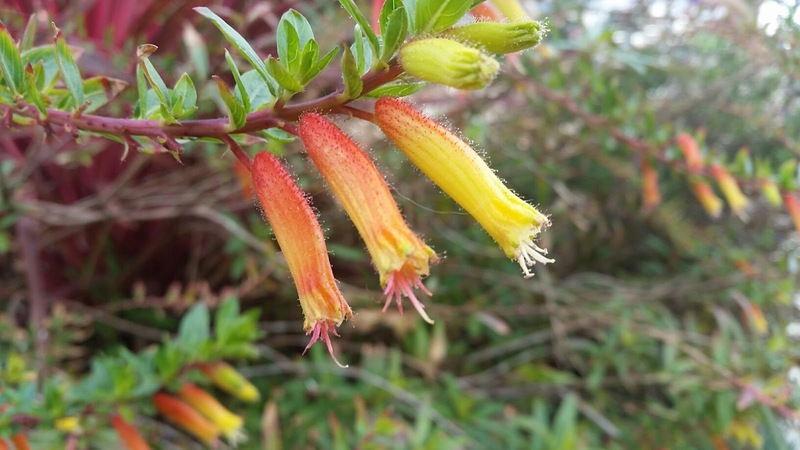 The orange flowered plant looks like some kind of Cuphea (possibly C. micropetala aka candy corn plant). And that is indeed a Leucadendron, possibly L. salignum 'Blush'. Looks like you had a fun trip to a beautiful place! What a treasure that book will be. That book is something special. When you come out here next, I'd love to show it to you. What a wonderful place to get away to, lucky you! Thanks for the beautiful photos. I love those books. You have had a blessed week. Oh my, what a delightful visit. Thank you for taking us along. Anne is definitely an artist with succulents. You are so welcome, Barbara - thank you for coming along! Anne is an artist, the whole family has a way with creative endeavors. I'm thrilled that you got to take this little getaway and relax with friends. Such beautiful photos came out of it. ..love the one with the sand dollars. Thank you Ricki! The sand dollars were plentiful right around the Super Moon - I found dozens but left most of them on the beach. Wow wow wow! I have never seen succulents grown so beautifully. I wish we could grow them up here, the variety of colors is astonishing. So glad you had a weekend full of friends and seaside views. 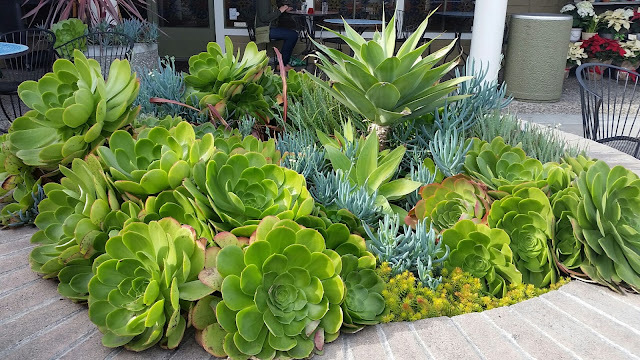 Wouldn't it be grand to grow such succulents here? It's amazing. A weekend full of friends and seaside views is always a grand one in my book. Oh yes, we eloped several years ago and had a quiet ceremony in the house. It was wonderful. Santa Cruz and the Bay Area will always be very special to me, having lived in Santa Cruz and San Francisco for many years. I'm a California girl at heart.